Weight is something I’ve struggled with on and off for most of my life. Over the years I’ve ranged from Jabba the Hutt proportions (high school) to lean and lanky (late 1990s and again from 2006-2009). Apart from these somewhat extreme phases my weight tends to fluctuate anywhere from ten to 20 pounds (or more), depending on two factors: diet and exercise, or the lack thereof. Most of 2011 and 2012 fell well within the “lack thereof” category. Back in November I decided that dropping the extra pounds was going to be a priority, so I began paying closer attention to my diet and returned to the gym after an absence of nearly three years (though all the while I still paid my monthly membership, you know, just in case…). Building on the modest successes of last November and December, I began at the start of the year a project notebook dedicated to health and fitness. For this endeavor I chose a Space 24 weekly journal by Exacompta which has fit well the specific needs of this journal format. The photo below captures the essence of the endeavor: for each day the column on the left serves as the “food diary” with the corresponding column to the right serving as “fitness diary”, including gym visits (and what was done), and other physical activity such as walking. Weekly weight goals (and actual weight) are also recorded. 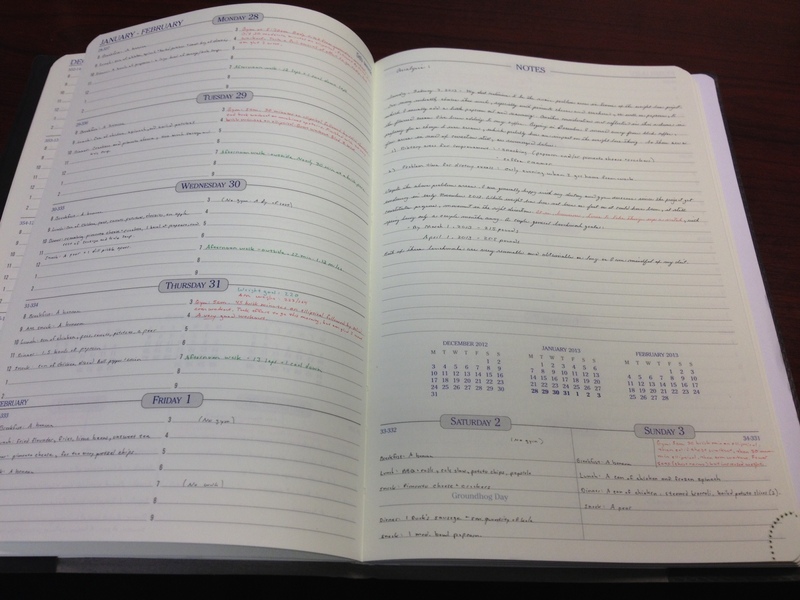 The blank page to the right provides ample room for an analysis of the week. What worked for me this week? What didn’t? What should I focus on the coming week? I tend to be a visual person and one aspect I rather like about the Space 24 are the monthly calendars near the front of the volume where I can capture gym visits and physical activity (see featured image above). Oh…and a fun note about the food diary: I have found that writing down what I eat each day is a GREAT deterrent from eating something I shouldn’t. The health and fitness journal is not nearly as much work as one might suspect once you develop the habit of taking a few moments here and there to record this and that. The rewards are certainly worth the effort, not only for the present time, but in the future should I begin slipping towards a position where such a struggle again becomes necessary.